Download the completed Grid Pro template for VDMX along with some sample clips in Hap 720p. Previously in this series, recreating the classic VIDVOX Grid using VDMX. In this video walkthrough we'll show how to turn the basic triggering and scrubbing app Grid to it's big brother Grid Pro, which added a number of powerful features like transitions for fading between clips, image FX processing, audio analysis, a text generator layer and direct to disk movie recording. For people already familiar with using Grid Pro for video DJing and mixing, the completed template is a good starting point for jumping into VDMX as a pre-built VJ instrument with your existing movie clips. Next, look at the tutorials to customize this layout to work with MIDI and OSC controllers, or further extended to a four channel mixer template. Adding visual FX to the Right layer. Separate FX chains can be applied to the Left, Right and final Mix. The 'Left' layer renders on top of the 'Right' layer. Change the 'Left' composition mode to adjust the type of blending used to fade between clips. 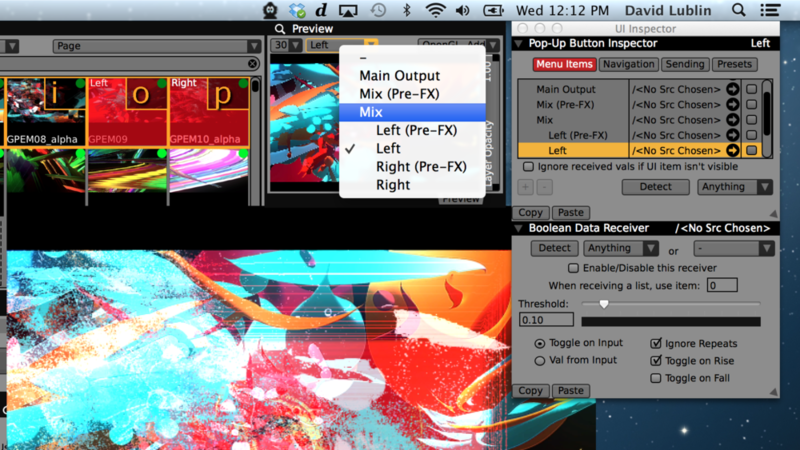 The pop-up menu in the 'Preview' window plugin can be used to change the viewed layer or mix group. Use the UI inspector to assign keyboard shortcuts. Set the voice mode of the 'Media Bin' to 'Cycle' and use the 'Auto-Fade' option in the Two Channel mixer for transitions. Create a layer with a text source to recreate the Grid Pro Fontsynth for overlays. 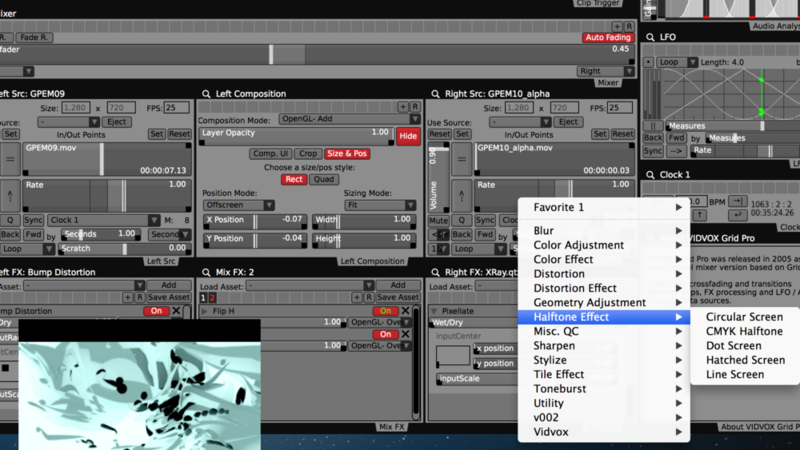 Audio Analysis and LFOs controllers from Grid Pro are available as plugins in VDMX. 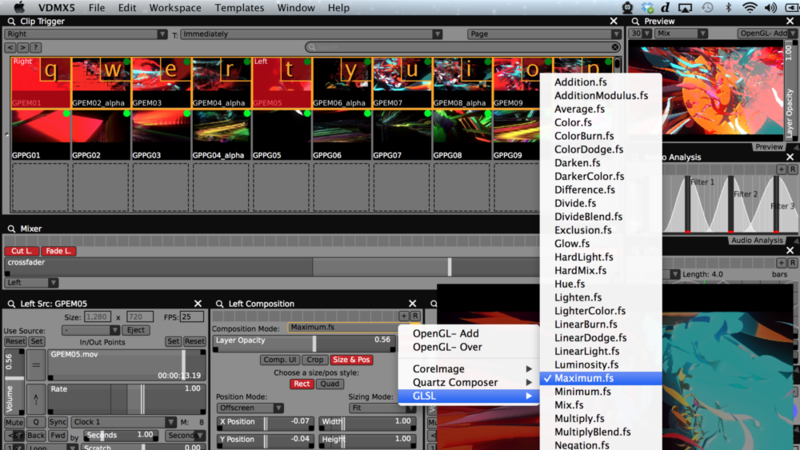 Screenshot for original Grid Pro video instrument. Completed Grid Pro template for VDMX.